One of my most anticipated games this year is For Honor, a Ubisoft release that features knights, Vikings, and samurai caught up in a thousand year war. Over the weekend, I played the closed beta to get a feel for the game, which is coming out in a couple of weeks. The first thing I did on Friday night was create my emblem. You can customize one with your choice of frame, colors, and symbols. Being a huge fan of customization in games — I spend hours on character creation screens, let me tell you — I had a blast personalizing the shield that would represent me throughout the game. (It appears next to your name in multiplayer matches, for instance.) I also noticed that the background music, which features rich and sometimes melancholy strings, is beautiful. Its classic sounds are a perfect match for the medieval-like setting of the game. After that, I underwent Training for a few minutes, which teaches players the basics of the game. This is very necessary, because the fighting in this game is unlike anything I’ve seen before. 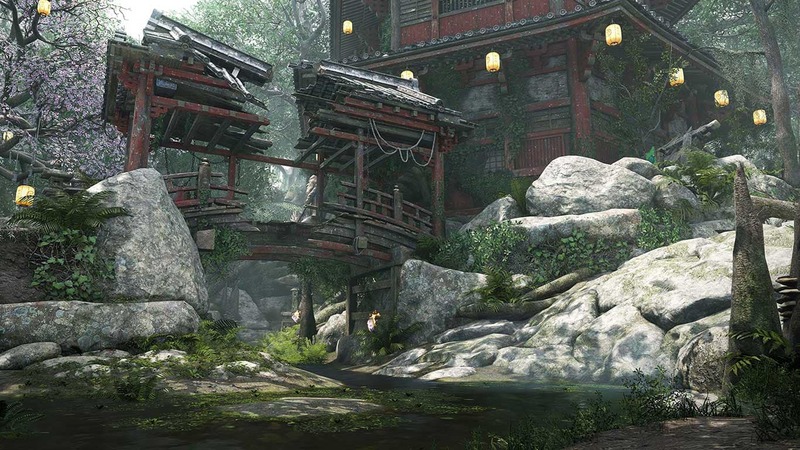 At its heart, For Honor is a game about dueling. It focuses on close quarters melee combat, and to succeed, you have to master the timing of your blocks, dodges, and attacks. You can take one of three stances — left, right, or up — to either guard or attack, and you can see the stance your opponent is taking so you can act accordingly. If they swing high, you block high. If you notice they’re moving their weapon to the left, you block to the left. And when you want to attack, you pay attention to where they’re blocking and try to hit them from another angle. After that, I launched into an epic multiplayer battle in Dominion, a zone-capturing mode that pits two teams of four players against each other, with AI enemies spawning all over the place to keep things chaotic. But chaos is the problem with this mode. After learning the nuanced combat system, I had trouble keeping up in the thrilling pace of Dominion. There were too many enemies. I was constantly overwhelmed. And I barely had a handle on how to block, dodge, and attack as it was. My boyfriend and I also tried the Brawl mode, which had us fight against two other players. This is a great set-up for the style of combat the game presents — but as beginners, it was too challenging for us. One of us would die fast, leaving the other to fight solo against the other two players. Being gained up on is not fun. Neither is dying and leaving your partner alone. I’m sure this mode is extremely exciting when you know what you’re doing, but what can I say — For Honor‘s gameplay is tough at first. Because the combat is incredibly unique, that also makes it totally unintuitive. It’s not a bad thing, but you need a campaign to master how to play. I had trouble remembering the controls at the beginning. And such timing-based fighting feels much better suited to one-on-one duels or small skirmishes than to the pandemonium of the Dominion multiplayer mode. Taking advice from my boyfriend, I then quit multiplayer and started practicing via the Duel Practice, which pits you against a low-level AI opponent with constant respawns so you can keep going for as long as you want. It’s the perfect place to master your technique — and just memorize the controls, for that matter. It’s also where I was able to try playing as each of the nine characters who were available in the beta. Character classes in For Honor are surprisingly deep and varied. You choose to play as a knight, samurai, or Viking — but each class also has several characters to select from, each with unique strengths and weaknesses. For instance, some characters are able to hold a block for an unlimited amount of time, while others — the ones who favor agility over strength, perhaps — only block for a couple of seconds before you have to re-position their guard. I had trouble with the latter, so I focused on characters with good defense. (I’m honestly not the best at blocking in games, so this whole system was a big challenge for me!) Each character also has a special move, such as push or kick that can throw an opponent off balance for a few seconds. While I originally intended to play as a knight, I quickly discovered that the Nobushi samurai was perfect for me. She has amazing range, she’s fast, her special move is an awesome kick, and she blocks really well. After almost an hour of practicing and playing with different characters, I jumped back into multiplayer. However, server connections in the beta were terrible, and I wasn’t able to matchmake with anyone or even connect with my boyfriend to play as a duo. The result was that for the rest of the weekend I was stuck playing the one-on-one Duel mode against the AI, in best-of-five rounds. It was a fun way to level up my Nobushi and practice some more, and as I said, dueling is the best method of playing for this style of combat. I was able to see that the different classes feel pretty balanced. 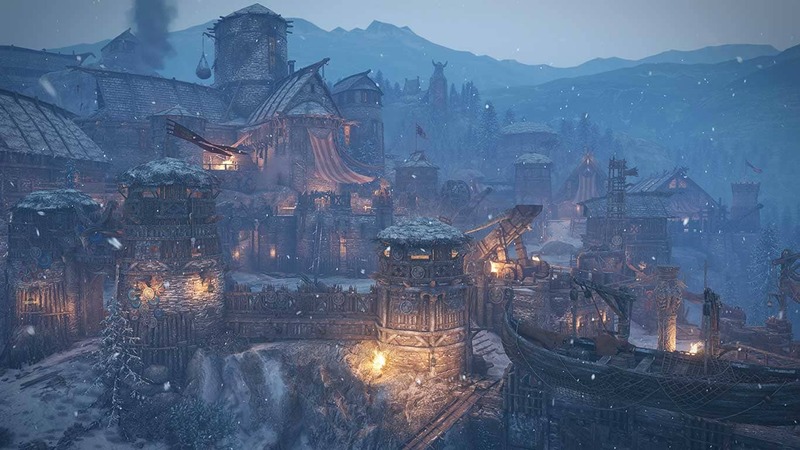 The various maps — including a cathedral, a forest, a Viking fort, and a temple — are stunning. But the mode grew repetitive fairly quickly, so I eventually called it a day. It would have been great to see how Dominion felt after feeling like I had mastered the combat to some extent. I guess I’ll have to wait for the game to come out to try it again. Customization is a big bonus! 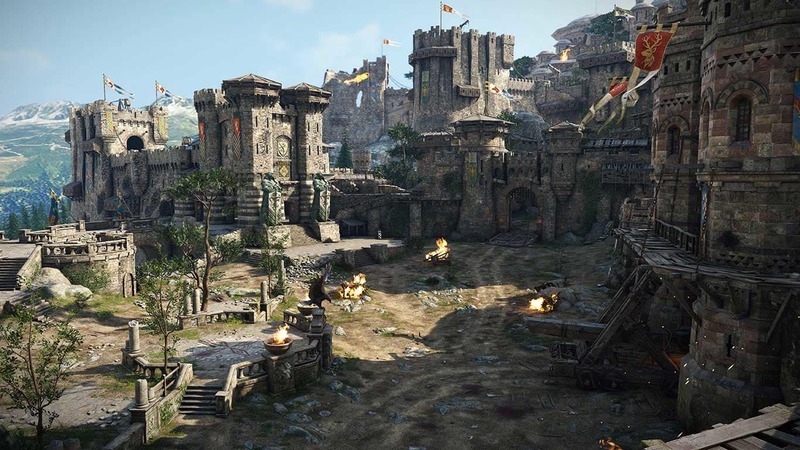 Mostly I’m excited to see what the story is like in For Honor. If the campaign focuses on dueling, I’m going to be so into it. The mythology of this world is the biggest mystery to me still, after the beta, so I can’t wait to dive into the full game when it comes in a couple of weeks. God that game looks amazing…. Yeah, it is super polished! I was kinda looking forward to it, but I just couldn’t get into the beta. It’s possible the campaign could win me over, but I soured on it from the multiplayer. Glad you enjoyed it though. And yeah, it does look fantastic. What kind of multiplayer did you try? I know what you mean, I definitely look forward to the campaign but I’m still on the fence about Dominion multiplayer, anyway. Im gonna keep my eye on it and see what the fan response is like at launch. My worry is that it will be cool for a little bit then die off fast. Yeah I know what you mean. That can be important for good multiplayer too. I really enjoyed the beta, but if Ubisoft keeps their aim to make it an online-required game, even for the campaign, I’m pretty skeptical. If multiplayer is the focus, I’d appreciate a lot more variety. But God the combat is fantastic. Yep the combat is so fun. I don’t mind the online requirement but I know it’s unfair to those not set up for it, and it is kinda ridiculous when a campaign requires it! I’m not a fan of the online requirement for the game, but the multiplayer may be worth the experience for some. That combat though… It’s wonderful. Haven’t been following this game, but the combat system does sound interesting. A little like Age of Conan’s, but more challenging from the sound of it. I’m not sure if it’s something I’d enjoy or not — I feel like this is the sort of thing you’ll either love or hate, with no in-between. I don’t know if I can spare the time or money for another game right now, but according to Google there will be an open beta soon, so I may check that out. Yeah, I know what you mean. It definitely takes a handful of matches to get somewhat comfortable with combat. Like you, I went full on panic mode the first few times which resulted in mistakes and button mashing. Definitely not what the game wants you to do. Thankfully the game has a ton of tools to better yourself. I did the Advanced Tutorial, which was massively helpful, watched the hero videos, and practiced a bit. I found that my skills with the Warden vastly improved and I didn’t panic as much during combat. I really likely dominion, but it can be an acquired taste. The key is to grab points, take out the minions for easy XP, and try and stick with your teammates. It’s fun once you get into the swing of things. Interesting. That makes sense, sticking with your team must be super helpful. I think I was always pretty disorganized during my time playing Dominion! I didn’t see the Advanced Tutorial, I’ll check it out next time. Yeah, it’s unfortunately buried a little bit in the menus, but it’s super helpful. Plus, the cool thing is, it’s not generalized like the basic tutorial. You can actually select any hero you want to learn more about. I really like the idea of a deep melee combat system like this taken into the online arena, but also worry that latency and things like that might hold it back for multiplayer. I’m definitely the kind of person who would need the campaign to deliver to decide to give this a go (ultimately I’m just not a big multiplayer guy I guess). Hopefully that turns out well because I like the sound of the combat and classes you talk about here.